What are the characteristics of a Christian? The name “Christian” was first given to the disciples. (Acts 11:26) So a Christian should also be a discipleA disciple is another word for a follower of Christ, one who is learning to be like his Master. As a disciple you follow Jesus Christ, who is the Master and by living like Him you become more like Him. (Matthew 16:24; 1 Peter 2:21-22)... More. The conditions for being a disciple are clearly written in Luke 14:26-27,33, “If anyone comes to Me and does not hate his father and mother, wife and children, brothers and sisters, yes, and his own life also, he cannot be My disciple.” Our relationship with our parents, marriage partner, children, possessions and our future in this world must be according to what Christ teaches us. We must be independent from them in our spirit, so that our relationship to them doesn’t hinder us from doing what is right and pure in God’s eyes. It is a great misunderstanding to think that being a Christian is the same as being a so-called “pardoned sinner”, implying that he is still bound to continue in sinSin is anything that goes against God’s will and His laws. To commit sin is to transgress or disobey these laws. The lust to sin dwells in human nature. In other words, it is contaminated and motivated by the sinful tendencies that dwell in all people as a result of the fall into sin and disobedience in the garden of Eden. This... More. In the verses below, we get a better understanding of what the will of God is for us, with regard to sinTo commit sin is to consciously do something that you know goes against God’s will. This can be in word, deed, or even thought. (James 1:14-15)... More. “My little children, these things I write to you, so that you may not sin.” 1 John 2:1. “I write to you, young men, because you have overcome the wicked one.” 1 John 2:13. “Now thanks be to God who always leads us in triumph in Christ …” 2 Corinthians 2:14. A Christian has a good conscience; he has put his past life in order; all his actions are in the light. All his sins are forgiven; he is grounded in God and has built his life on the Rock, which is Christ. He is immovable. Being a Christian does not mean you are a religious “meeting-goer,” someone who goes to Christian meetings rather than to places of worldlyThe term “worldly” is used to describe anything that is purposed towards the world’s goals/ideals/pursuits as opposed to that which is of the Spirit. (1 John 2:15-17; Titus 2:11-12)... More entertainment, but otherwise is just like other people. Not at all! A Christian is someone who brings his life into complete harmony with the Word of God and His will. He is righteous where others are unrighteous; he is patient where others are impatient, diligent where others are lazy, and exact where others are inexact. He speaks the truth boldly where others flatter, play the hypocrite, and lie. He is meek, longsuffering, and quiet where others are hot-tempered and impetuous, etc. (1 Peter 1:15) All these are traits of a true Christian. A Christian is somebody that is not being influenced by the spirit of the timesThe spirit of the times is the evil spirit found in much of the world’s modern culture/attitudes. It is not constant, and can vary from era to era and culture to culture. Though not always obviously evil in itself, the spirit of the times will always be instrumental in leading people away from serving and obeying God. (1 Corinthians 2:12;... More. A large number of people in the world are living in sin. They follow their passions and desiresThe desires that we experience that go against God’s will. In other words, a desire for anything sinful. See James 1:14. Also called “sin in the flesh.” Although the expression “youthful lusts” is often thought of in connection with sinful sexual desires, lusts include anything that go against what is good and right in God’s eyes. (2 Timothy 2:22.; Galatians... More and few think it is wrong. There is a spirit behind them, and this spirit is called “the spirit of the times.” It is particularly difficult to resist this spirit. What is commonly known as “fashion” is representative of this spirit. An ungodly person can be likened to a lifeless marionette. Whenever one power or another pulls the strings, he has to jump and dance, whether he wants to or not. A Christian has Christ as his sole Lord and ruler. Then he does not obey other powers; he does not obey the fashions or the spirit of the times, even if everyone else does. Being a Christian means that that person is righteous in all his affairs. Therefore if he has stolen anything or committed some other act of unrighteousness, he will make restitution as soon as he becomes a Christian. If he is in debt, he will make every effort to pay it back. There is no way around it. In this respect it does not help to appeal to the atonement. If he does not practice righteousness, he is not a Christian at all, and he will not enter the kingdom of God. “Everyone who practices righteousness is born of Him.” 1 John 2:29. A Christian, because of his progressive victory over his own lust and desires, starts to enjoy perfect rest in his heart and mind. His life, being purified by the help of his Saviour, becomes more and more irreproachable and blameless. No one can any longer point the finger at manifest sin such as outbursts of anger, irritation or any unrighteousness. As the Christian appreciates the power of the Holy Spirit in his life more and more, he naturally becomes stronger and stronger by the same Spirit. The Christian can endure trialsTribulations or trials refer to any event or situation that comes your way that tempts you to sin; that gives opportunity for sinful thoughts and temptations to rise up in you. The tribulation or trial arises when your mind to serve God struggles against your lusts to sin. It also often refers to difficult situations that test your ability to... More, discomfort, good report and evil report. This he does as he is confident that he serves a faithful Master. What was impossible for him in the past, he is now able to overcome. This is especially noticed by those that are themselves in need of overcoming. However, we cannot expect to have perfect victory right away, which is why we read, “If anyone sins, we have an Advocate with the Father, Jesus Christ the righteous. And He Himself is the propitiation for our sins, and not for ours only but also for the whole world.” 1 John 2:1-2. Nevertheless, it is of the utmost importance that a Christian is not content with sufferingThe Bible often mentions suffering. Though this can refer to outward, physical suffering, in the New Covenant it mostly applies to the suffering that occurs when you deny your own sinful lusts and desires and put them to death. It is an inner suffering that occurs because your lusts are not being satisfied, rather than a physical, outward one –... More defeat, and so becomes slack and indifferent. He must not lose courage and give up in his fightAlmost all talk of battles and wars when concerning a Christian life refers to the inner battle that arises when a sinful thought tempts you. God’s Spirit and the flesh are at odds. When you have decided to only do God’s will and are being led by the Spirit, a conflict between the flesh and the Spirit arises: there is... More against sin, because it takes time to become and to be an overcomer. He must continue to live in hope and faith, pressing on until he breaks through to a victorious life. This is all done by the assistance of and obedience to the Holy Spirit of God. It is especially blessed to be in a fellowshipFellowship means communion with other Christians who are living the same life that you are. It includes mutual edification and a unity in purpose and spirit that goes far deeper than friendship or human relationships. (1 John 1:7) We also experience fellowship with Christ when we overcome sin in the time of temptation just as He did when He was... More of Christians that has the same desire and will to overcome. Such people are led by their great Shepherd – Jesus Christ – as they are following Him in His steps. Having been faithful to God by obeying his commandments as given to him by God’s Son, Jesus Christ, a Christian will be rewarded with everlasting life. 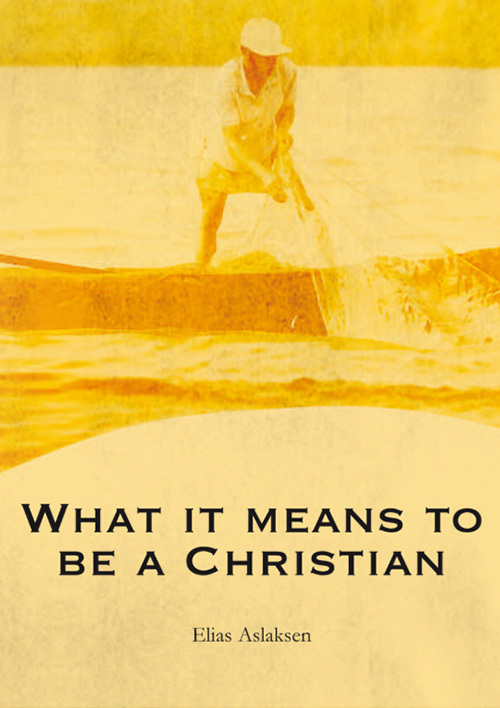 Being a ChristianWhat is a Christian?